Life's a beach - especially when you land a Top Tier link! We Are Promotional wanted to increase search visibility for queries relating to their ‘beach towel’ category page and needed an agency that was creative enough to think outside the box to develop topic-led campaigns, all year round. The target was to achieve mid to top-tier links to influence visibility at category page level. As We Are Promotional came on board at the end of the summer, we’d missed the boat on the usual beach towel related ideas and angles so we had to think outside the box and think about holidays and tourism in a wider sense. At the time, the new Netflix series Dark Tourist had just been released and was a hot topic within the media. We wanted to capitalise on this trend and provide journalists with a relevant campaign with a solid hook. Our in-house content team, did research into the concept of ‘dark tourism’ and found that it had been trending as a search query too – we had our hook! So we created a listicle featuring 7 of Europe’s darkest and weirdest weekend breaks. 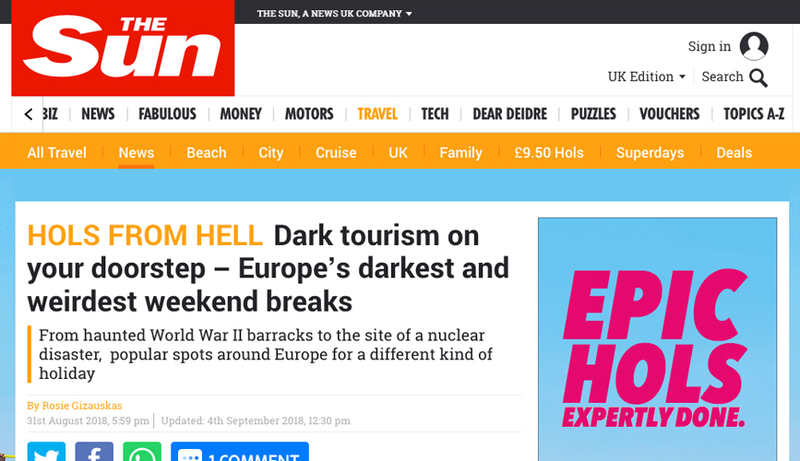 The Sun immediately picked up the article and coverage snowballed, with many sites asking for more bespoke lists of dark tourist hot spots for their audience. Want to know more about Digital PR & Outreach? Engaging people, the world over.